My version of this classic Italian dish. Layers of rich smooth beef bolognese, creamy cheese bechamel separated by egg lasagna sheets topped with cheddar and Parmesan cheese. 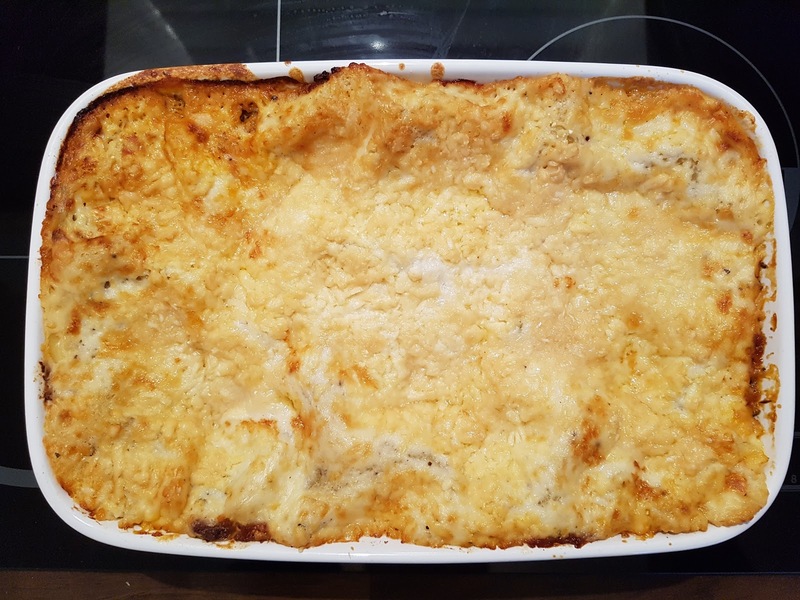 For me a lasagna should have a rich smooth bolognese and this is achieved by making a paste from the flavour base of tomato paste, onion, celery, carrot, garlic, herbs and spices. The paste is fried to release its flavours like you would do to a curry paste. Mince is browned in a separate pan, drained then added to the paste. Passata, red wine, seasoning, a little sugar and a dash of Worcester sauce give the bolognese a wonderful deep rich flavour. The bechamel should be nice and creamy and is made with flour, butter, milk, pinch of nutmeg, oregano, seasoning and some grated cheese. Its important not to over season it as a lot of salt will come out of the added cheese. Many people will say you must use fresh pasta, but I am a fan of good quality dried pasta – as are many of the worlds top chefs, who use it in their high end restaurants. Start by browning the mince in the frying pan over a medium heat, once browned tip the mince into a colander to drain the mince of the excess fat. Set aside. Next add the paste to the pan and fry over a medium heat, stirring frequently for 4-5 minutes. You want to cook the paste through to release all its wonderful flavours. If the paste sticks to the pan loosen with a little water rather than adding any extra oil. Tip the mince back in and stir well until the mince and paste are combined, fry for a further minute or so then add the passata, the red wine, a desert spoon of brown sugar and a generous dash of Worcester sauce. Stir well and heat through to a boil, then reduce to a simmer for 10 minutes. Now make the bechamel sauce. Start by melting the butter over a medium heat then add a heaped desert spoon of plain flour. Stir well to form a smooth paste then start adding the milk and as it heats the sauce will thicken. Once half the milk (approx 250ml) is added sprinkle in a pinch of oregano and nutmeg along with a little ground black pepper. Keep adding the milk and bringing it to a simmer until the sauce does not thicken any more. The sauce should be of the same consistency as a batter. Tip: is best to add a little at a time as it is easier to keep the sauce smooth. It is vital to keep stirring to keep the sauce smooth and to prevent the flour sticking to pan bottom and burning. If the sauce does become lumpy use a whisk to make it smooth again. Once the sauce is ready add 50g grated cheddar and 10g grated Parmesan and stir through the sauce until it has melted, this will give the sauce a creamy cheese taste, perfect to balance the rich bolognese. Pre heat your oven to 180॰c/170॰c fan assisted. Now to assemble the dish: layer the bottom of the dish with pasta sheets, cut them to size if required. Then spoon a generous layer of the bolognese (use approx half) over the pasta. Now add a layer of pasta sheets on top of the bolognese then spoon a generous layer of the bechamel sauce on top. Add a further layer of pasta, then spoon the rest of the bolognese on top before adding a layer of pasta sheets on top. Pour a generous layer of bechamel on top then sprinkle a good covering of grated cheddar and Parmesan on top. Add to the centre of the oven and cook for 35-40 minutes until the dish is bubbling and the cheese on top has turned golden. Remove from the oven, it is best to let the dish sit for at least 30 minutes before eating if you can wait that long!